I have been lurking on this board for years now and have never really had anything to contribute due to a lack of fishing. Trying to get back into again and am starting with a trip tomorrow with the General... Todd and I have been friends since our college years and I am really looking forward to getting out there with him for our Flint trip. Look forward to meeting some of ya'll soon, great group of guys around here. Years fishing: All my life but really got back into it this year. Years kayakfishing: about 60 days whooooohoooo! Saltwater: just caught my first Trout and Redfish Mostly I've been pier fishing and crabbing. Joined GRF: To learn more about freshwater fishing in the rivers and streams of GA since that's where I live. "Ego is the troll that lives under the bridge between your heart and mind." Welcome to GRF. You'll meet some great folks on here. Enjoy! Welcome to the board MJ. Welcome MJ, look forward to meeting you on the French Broad in a few weeks! Been lurking a long time,decided to jine' up! My Dad grew up on the Ocmulgee at Juliette ( actually lived in the old bridge's toll keepers house. ),as well as both Monroe and Jones Co. sides. He knew every hole over there,behind and below the dam. I wish I had payed closer attention,but he taught me a lot. I now got both knee replaced ( one of 'em twice ) and can't do much but enjoy you guys posts and pictures. Welcome to the board Popup. ...just joined, first post, etc. I've been reading the articles and using the links for a year or so, but haven't even lurked on the boards. I fish every weekend, but mostly ponds and small lakes for LMB. My wife is also an avid fisherman, and we have a 12-foot jon boat we've dubbed "the Watermelon." (Yeah, there's a story with that, too.) Looking forward to meeting you, learning from you, and maybe getting to fish with you. Never argue with an idiot; he'll just drag you down to his level and beat you with experience. As others have said, I've been lurking and decided to join the fun. I was very happy to discover this site that is dedicated to river fishing. I introduced myself to river fishing on the Canoochee near Savannah. Since that time, no other form of fishing has held my attention in the same way. Look forward to wetting a line with some of you in the near future. Jesus said to go fish. He never said anything about raking leaves, painting the house, cleaning the gutters, taking out the trash, picking up the dry cleaning, changing the oil or walking the dog. Welcome aboard swamp rat!! I think you'll enjoy the info and fellowship here. The pictures area darn good too. I just joined today. I have been reading the posts for several weeks off and on and decided to join. I do a lot of tournament fishing for crappie. I recently bought a canoe to add to my list of toys and I can’t wait to use it. Anyway, I look forward to getting on the river for a few fishing trips. I just joined today. I've read the forum for about a year. 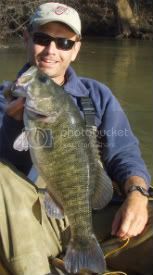 I fish a river in GA for shoal bass and I have fished the Nolichucky River in TN and the Little Tennessee in N.C. for Smallmouth. My dad doesn't live far from Columbia S.C., and after he has knee surgery I'm looking forward to fishing the Broad River. I think this group has the ability to do some good for the rivers in this state and the others around it. I just felt like it was time to join and I'm proud to be apart of it.